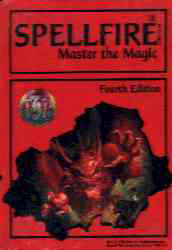 The Spellfire Design Team was given the go ahead to substantially redesign the basic game set. We brought in what we felt were the best of the first five booster sets and three editions. To these we added about 50% new cards. It must have been good, it sold out quickly and Fourth Edition decks are extremely hard to find to this day. The chase cards were shot on out photographer's trip to New Mexico. We had the challenging job of writing cards to random pictures of rocks and caverns. As I recall, Jim Butler designed most of them and did a great job.